Photo Caption: Redone 55gal -switched over to planted tank. 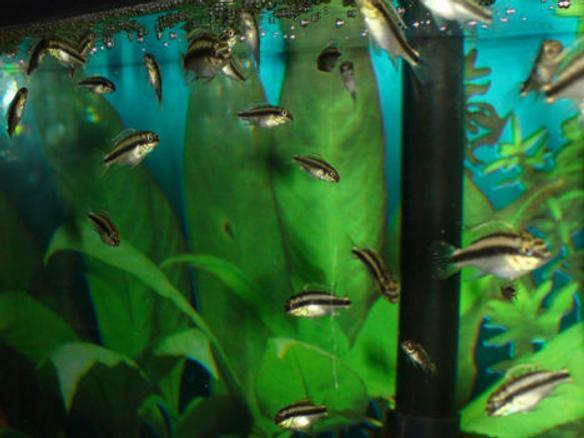 Have one male krib (female died), black neons, redfinned tetras, rasboras, cories, hatchet fish, boesmani rainbows, and otos. Rena XP2 filter, river decor with air bubbles, driftwood with anubius, sword, bacopa, cryptoccoryne, mini sword,sagittaria, fake cabomba because I can't grow that one, and a couple of fake low round leaf plants. Ecocomplete is substrate with some natural medium gravel. This picture has been rated : 97 times. 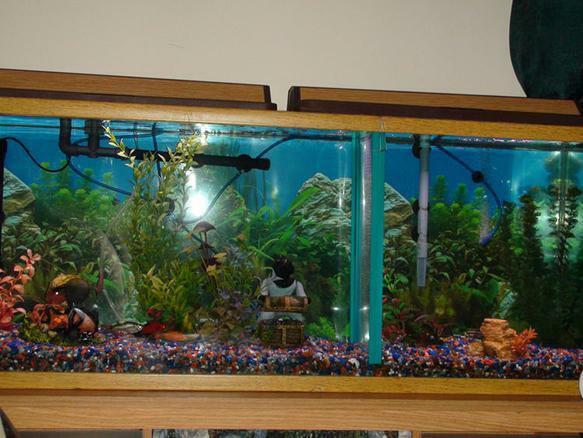 Description: I have 3 community tanks, a 15 tall at work, a 55 long in my living room and a 90 in my office which is currently emply but working on setting up as an African cichlid tank, Lake Malawi & Victoria. I have had my 55 the longest (3 years) and am swiitching it over to a planted tank which is now complete.I use a Rena XP2, a Stealth heater, 3 airstones, and I use the Seachem ammonia, and PH in tank indicators. Fish Kept: In my 15 tall at work, I have 8 neon tetras, one angel, 2 cories, 2 dwarf pleco. In my 55 I have my surviving male krib, 1 angel, 3 cories, 3 otos, 9 black neons, 3 rasboras, 7 bloodfin tetras, 3 bosemani rainbows, 3 hatchets. 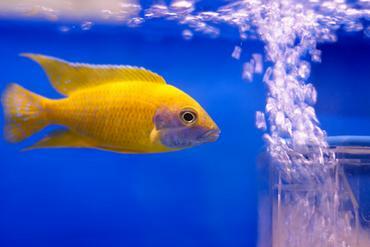 I have no fish in my 90 yet as it is a project which I was turned on to looking at your site one day and the African cichlid tanks were #1, and #4. Cool fish! I have just finished my BG and installed 90% in my 90 so we are getting closer. I also have an 18 tall with about 30 baby kribs in it. 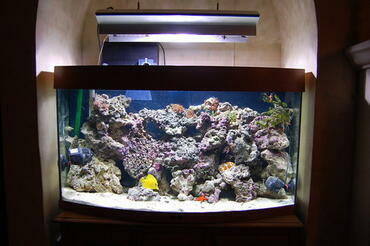 Corals/Plants: My 55 is now a planted tank -see description, my 15 and 18 just have plastic plants in them. My 90 will have real plants too. Quote: "Jesus sweated blood over the task that lay before him. He could have escaped his brutal execution at any time, but he didin't..He stayed there for you." 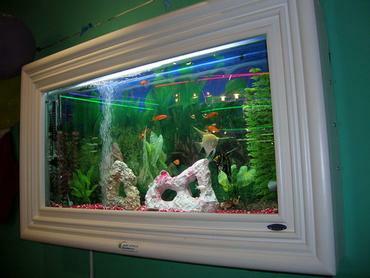 About Yourself: I had a fish tank when I was a wee child but left the heater on overnight and killed all my fish. I was devastated. My hubby and I after raising our daughter decided to adopt two older siblings. To help teach them about responsibility my son got a betta to care for (and my daughter a parakeet). I fell in love with this hobby!! A neighbor was moving and had a 55 gal with stand and all equipment and wanted to give it away. No one else wanted it so I thought sure I'll try it with a big tank! We all LOVE it! It is so peaceful to come home to or when one is not feeling well to just sit and watch the fish. I work as a medical social worker for oncology which can be emotionally draining and so I really enjoy the calmness of the tank. We have also really enjoyed raising fry when we can. The on swordfish I have in my 55 is one of our babies. They didn't usually live in tank as my angel (who has passed on) used to eat them and I think the gourami did too. The kribs are awesome parents and have been fun to watch them protect the fry even with the divider in the tank!